I serviced the engine during winter, changed chains, sprockets, gaskets...meaning, whole front end was teared apart. But during cold weather I did not need A/C cooling. But still, A/C cooling no go. Then I checked A/C compressor. Took off electrical connection and wired it directly to 12V+, and compressor kicked-in instantly, and vent blowing out ice-cool air. Nice, compressor is OK. But still my auto A/C does not work. Actually, hotter it get's outside, more hot air it blows in. Not as hot as if I turn it to full heat, but still it's hotter than outside air. Any ideas what else could I check myself, before visiting the dealership? Well, I came down to possible malfunction of A/C pressure sensor in front refrigerator. Anybody have any data on how/what to measure to test if pressure sensor is OK? - Auto-test of A/C components, but could not initiate it. Test should be performed doing those steps: Ignition ON, then turn Vent dial CCV + Temp dial CV, release them and press AUTO within 3 seconds. Tried multiple times, but could not get it started. So, what I know so far? 2.) 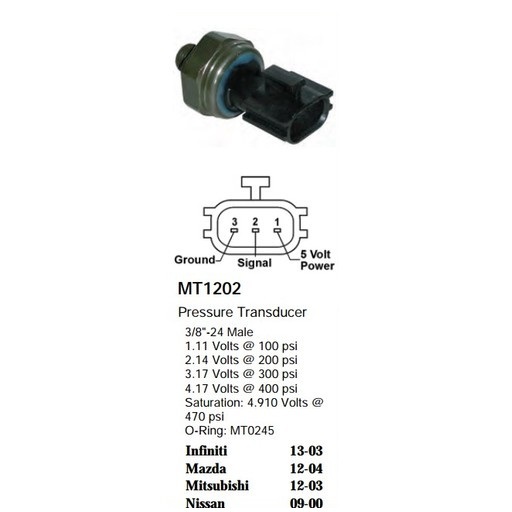 Obviously some other component does not give OK signal, most probably A/C pressure switch. I've tested +5V at A/C refrigerant pressure switch, so it's getting power supply. Would like to manually bypass its OK signal, but how? Finally got to proper data about A/C refrigerant pressure sensor. what I did was connect 2kOhm and then 50kOhm resistor between 5V feed and return Signal wire to bypass the sensor. In one case A/C kicked in alone, and in other case A/C + refrigerator cooler fan both kicked in. Which is OK...in one case CPU thought refrigerant pressure is within low limit, meaning it's not hot, so only compressor kicked in, while in other case CPU detected high pressure, meaning refrigerant is hot and needs cooling. With this simple procedure I found out, that my NEW A/C pressure switch is broken and needs to be replaced. Took me 1 month to check everything else and come back to just replaced (obviously failed) pressure switch, which needs warranty replacement. Friggin awesome info on the switch! I was just going through the same thing on my 2010 rogue which uses the same switch. Fortunately I had a Genuine Nissan one in my tool box, so I replaced it, and the AC works wonderfully now. Sorry I didn't see this post sooner, could have at least chimed in! This switch is screwed on to the dryer correct? Do you have to discharge your refrigerant before removing the switch? Yes if you don't it will all leak out when you remove the switch and you'll freeze yours hand.